Only three simple ingredients required to make a nostalgic spin on your favorite candy! 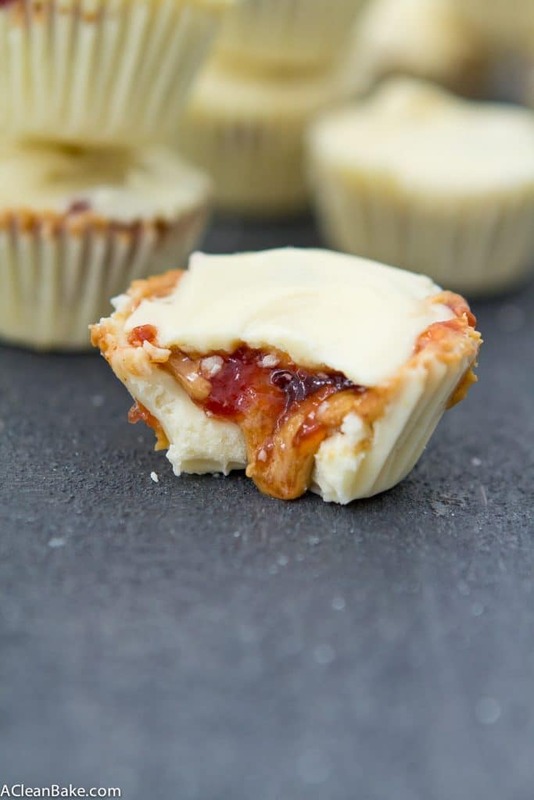 These peanut butter & jelly cups are naturally gluten free and vegan, and you can replace the peanut butter for your favorite nut or seed butter to make them paleo. 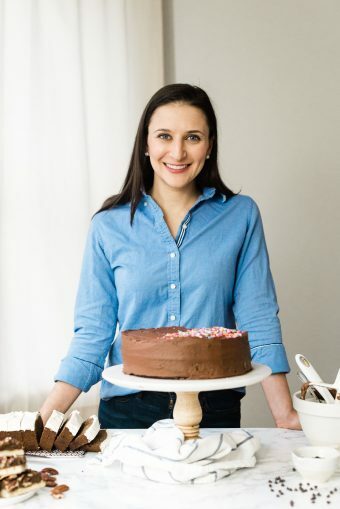 Happy Belated Valentine’s Day, and welcome to the last week of all-chocolate recipes – though, knowing me, there is probably more chocolate in the immediate future. I’m not going to say for sure though because I like the suspense! Anyway, yesterday, on Instagram, I compared us to chocolate chip cookie dough and brownie batter which, if you haven’t tried brookies, go together swimmingly. But what I should have said – perhaps, the more apt and familiar metaphor – is that I love you like peanut butter loves jelly. Or like jelly loves peanut butter, if you prefer. Either way, a match made in heaven. The only thing that could improve on this partnership is chocolate which, if we’re still speaking metaphorically, I have no idea what the chocolate represents so, just to be clear, I do mean that literally. 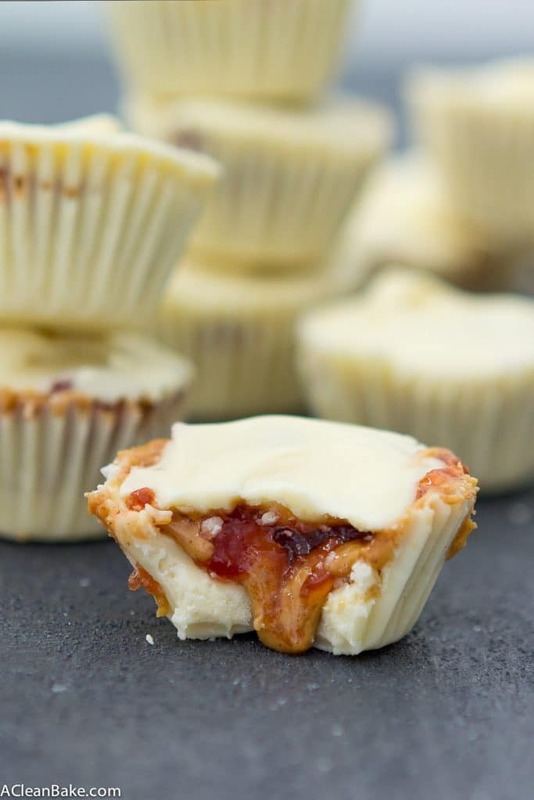 Yes, go ahead and douse your pb&j in chocolate. Because, honestly, if you can think of any way that that plan could go awry, I’d like to hear it. Oh wait, that last one is more a recommendation than a suggestion. 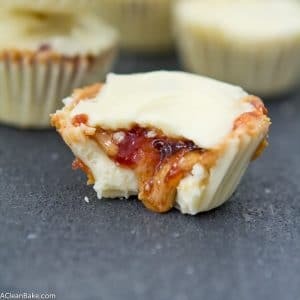 I can’t wait to hear how much you love me in a month or two when you find that extra batch of white chocolate peanut butter & jelly cups stashed in the back on your freezer. Then I’ll really have earned the title of your Valentine! Line a 12-compartment mini muffin pan with liners or spray liberally (liners are recommended for easiest removal once the cups have set). Set aside. In a small, heatproof bowl, melt the chocolate in the microwave in 30-second increments, stirring in between. You can use the stovetop double boiler method, if you prefer. 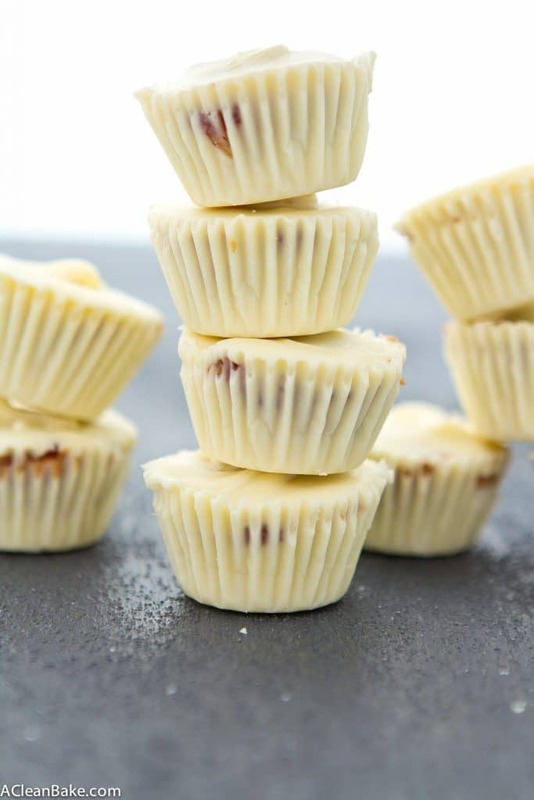 Divide about half of the white chocolate between the 12 compartments of the muffin tin. This amounts to a scant Tablespoon of chocolate per cup. Use the back of a teaspoon or measuring spoon to work the chocolate up the sides of each compartment, creating a little cup of chocolate. Refrigerate for 10-15 minutes to firm up the chocolate, slightly. Divide the peanut butter among the 12 cups (just over a teaspoon of peanut butter per cup). Repeat with the jelly. 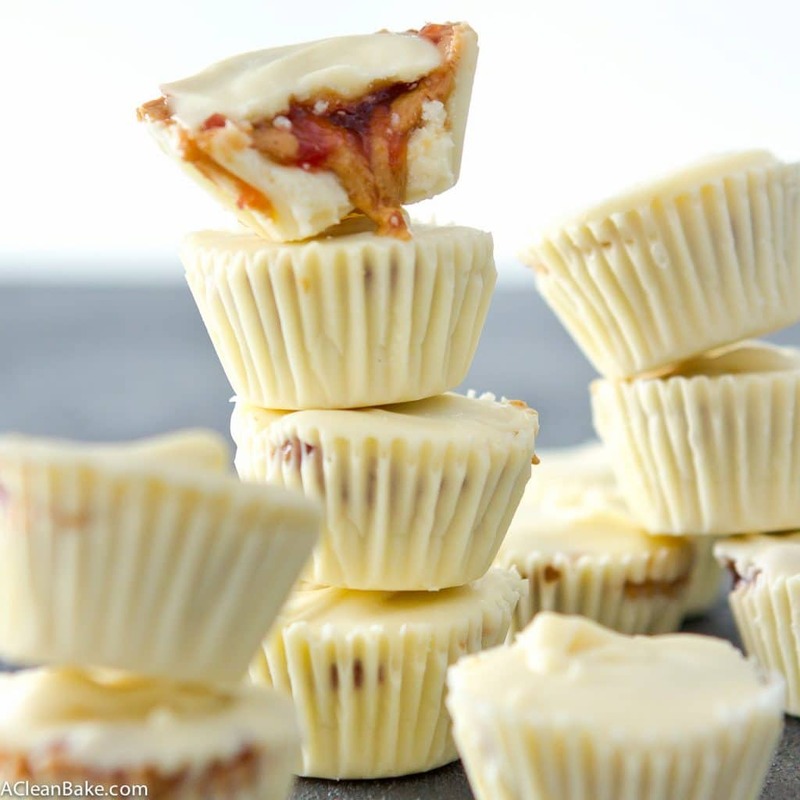 Divide the remaining chocolate among the 12 cups, using the back of your teaspoon or measuring spoon to swirl it into an even layer that completely covers the peanut butter and jelly. Allow the chocolate to set at room temperature before serving. If you're having trouble measuring and spooning the peanut butter and/or jelly, try microwaving each in a heatproof bowl for 10-20 seconds. Warming them will make them runnier and easier to stir and separate into small amounts. Store leftovers in an airtight container in the fridge for up to a week, or in the freezer for up to 3 months. Bring to room temperature before serving. Mmmm! Mmmm! Mmmm Nora. These are making me want to be a kid all over again. . .when PB&J was king. Ahhh. . .but since I have the maturity of a kid, it’s still perfectly acceptable for me to stuff a whole stack directly into my mouth, now isn’t it? And look at that drippy peanut butter beckoning me. Such a tease!